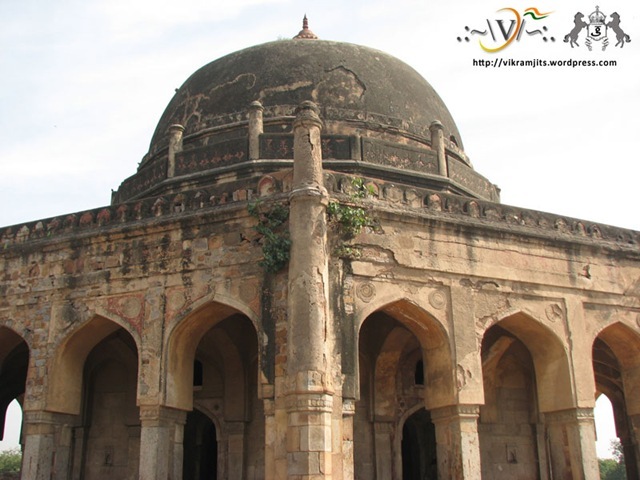 Situated right behind the Qutub Minar, in front of Mehrauli Bus Stand, is Adam Khan’s Tomb, popularly known as Bhool Bhulaiya (lybrinth). 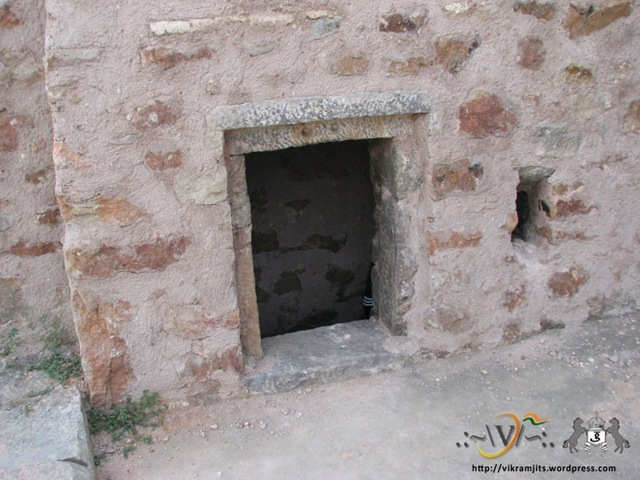 It is said that once an entire ‘baraat’ was lost inside this tomb. Looking at this place, the story seems to be very fictitious, but if you see the large dense forest of Quila Rai Pithora (or Lal Kot) behind it, you can make out that it is possible for a huge gathering to get lost in there. 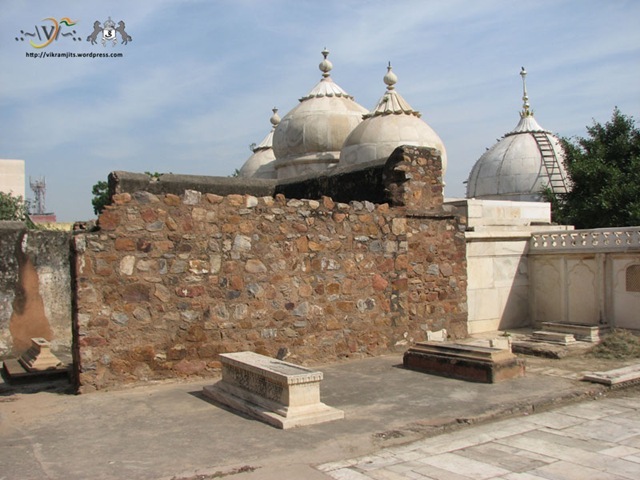 Adam Khan was the son of Akbar’s wet nurse Maham Anga. 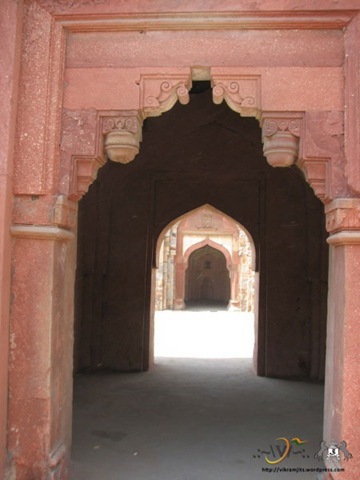 When Adam Khan killed the husband of JiJi Anga, Ataga Khan, he was thrown from the top of Agra’s Red Fort twice by Akbar. Later, in grief, his mother passed away. 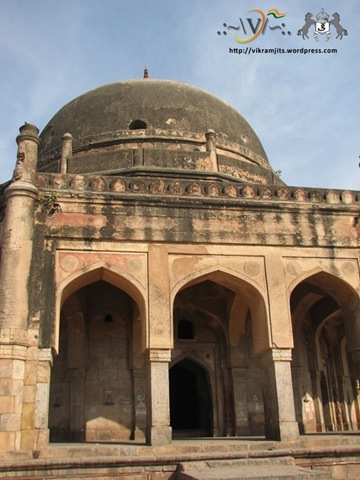 Akbar, then built this tomb for Adam Khan. 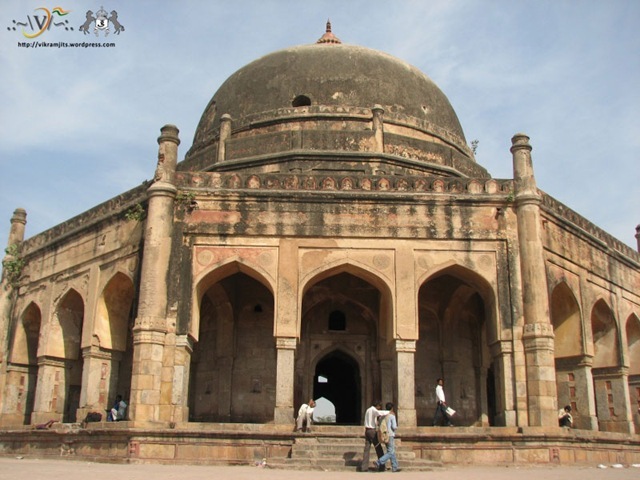 Surmounted by a dome, the tomb is popularly known as Bhulbhulaiyan, due to its labyrinth where one may lose one’s way in the corridors of the tomb. 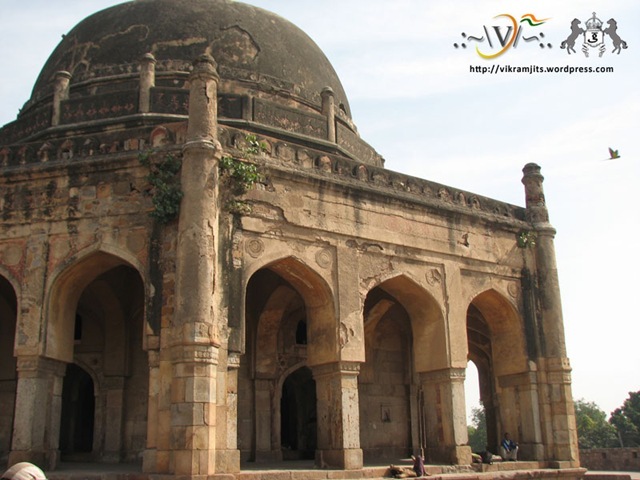 The tomb is built in Lodi style with a verandah on each side with three openings and that too without the usual eaves below the parapets. It is said that in the early 19th century, the tomb was converted into a residence of an Englishman named Blake of the Bengal Civil Service. 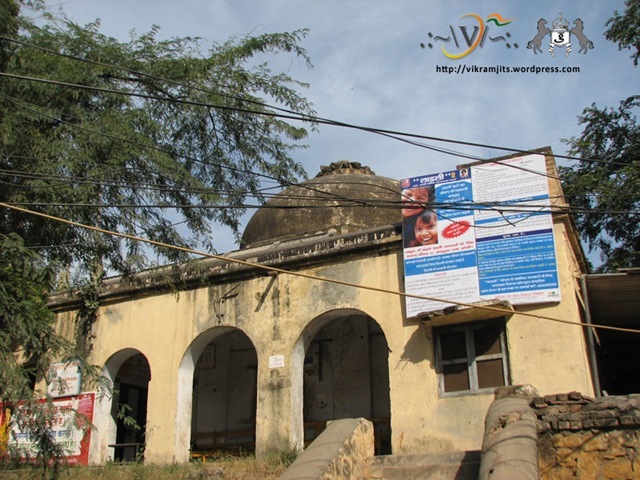 Later the tomb was also used or misused as a police station, post office and even a rest house. The tomb was finally vacated and maintained as a monument on the orders of Lord Curzon. 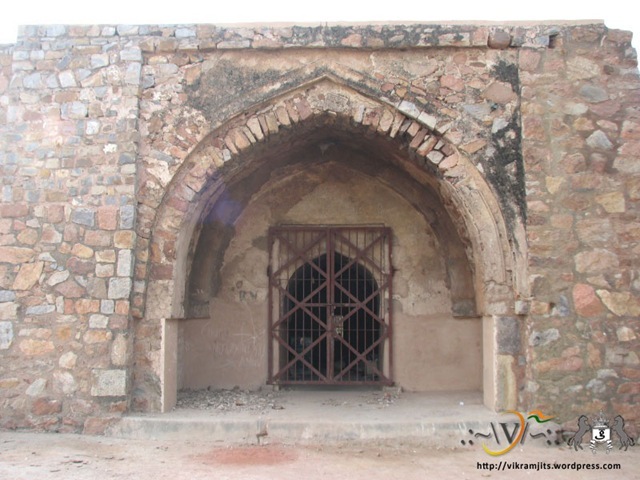 The last picture above (right) is of a lodhi era building situated near tomb, now being used as a medical facility. 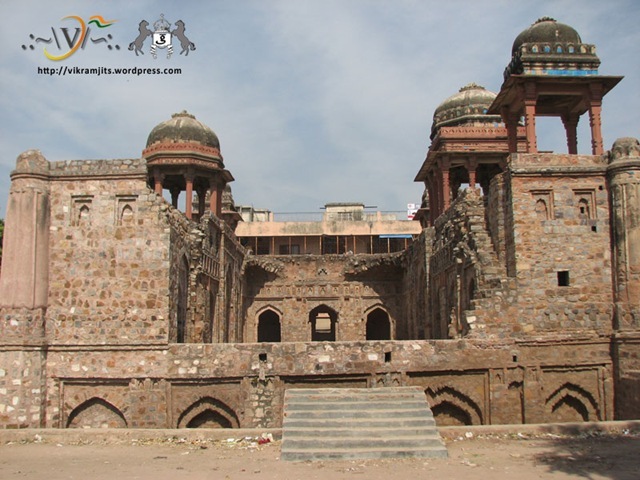 Jahaz Mahal was a Sarai (inn) built between 1451 AD and 1526 AD for pilgrims visiting Delhi from Afghanistan, Ira, Iraq, Arabia, Morocco, Turkey and other Islamic Countries to the Muslim shrines like Hazrat Kaki’s Dargah and Hazrat Nizamuddin’s Dargah. 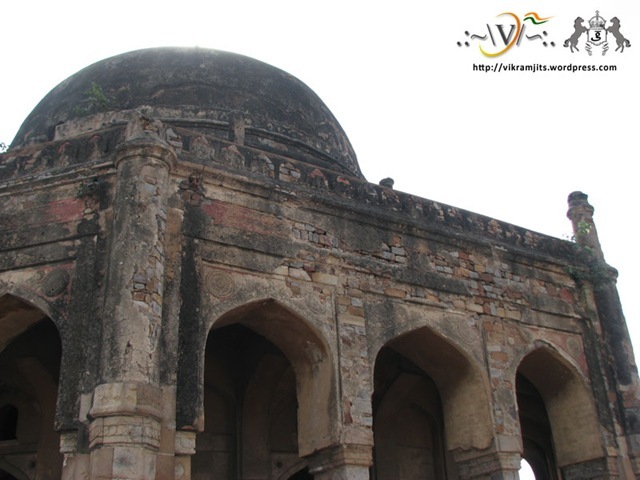 It was built during Lodhi Dynasty, next to Hauz-i-Shamsi. the name Jahaz Mahal (The Ship Palace) was given because of its ship like reflection in water body next to it. 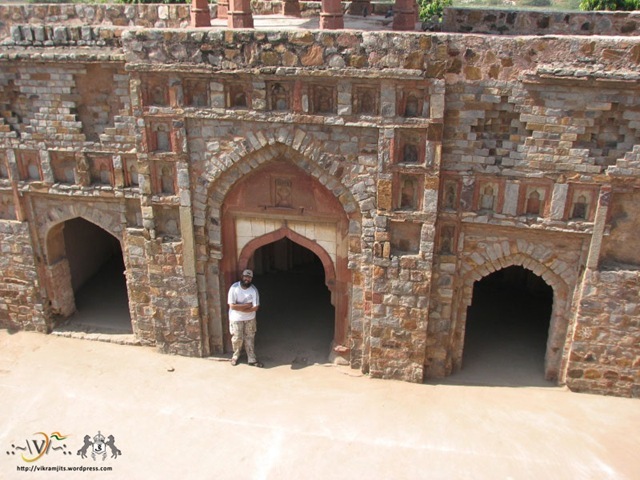 Hauz-i-Shamsi was a water reservoir built by the Mamluk Emperor Shams-ud-din Iltutmish in 1230 (200 years before Jahaz Mahal). 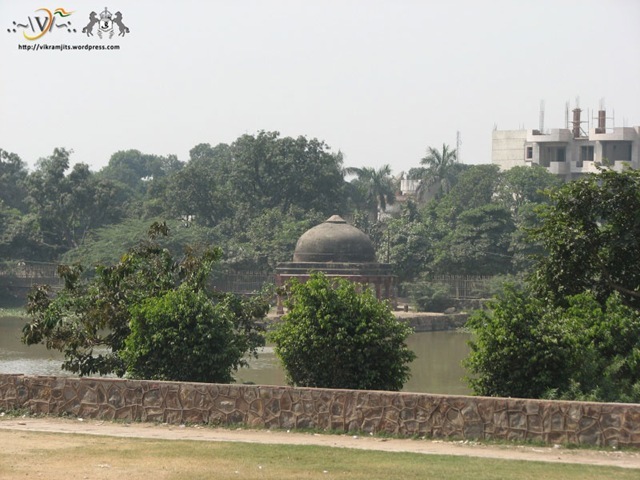 At the edge of this Water body, is the tomb of 17th century Persian writer of Mughal Court Abul Haqq Dehlavi. A popular legend narrated is of Iltumish’s dream in which Prophet Muhammad directed him to build a reservoir at a particular site. 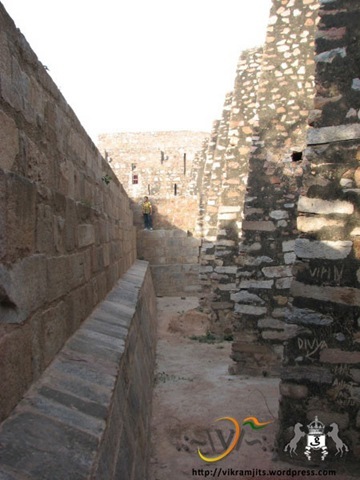 When Iltumish inspected the site the day after his dream, he reported to have found a hoof print of Muhammad’s horse. 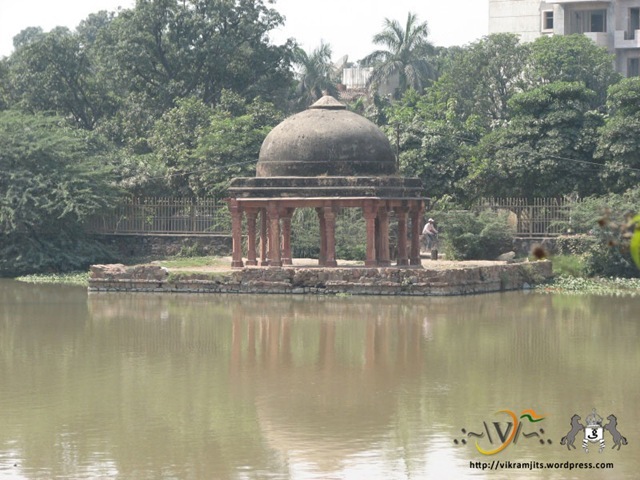 He then erected a pavilion to mark the sacred location and excavated a large tank (reservoir) around the pavilion to harvest rain water. 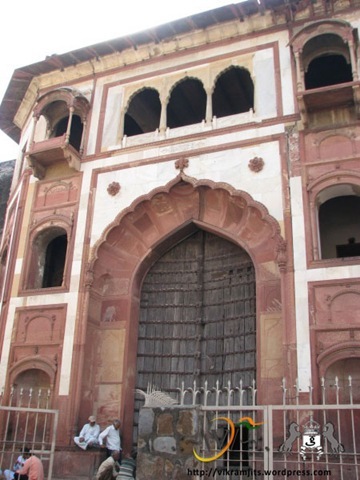 The Zafar Mahal, adjacent to Dargah of Hazrat Bakhtiyar Kaki (r.a.), was the summer palace of later mughal kings. 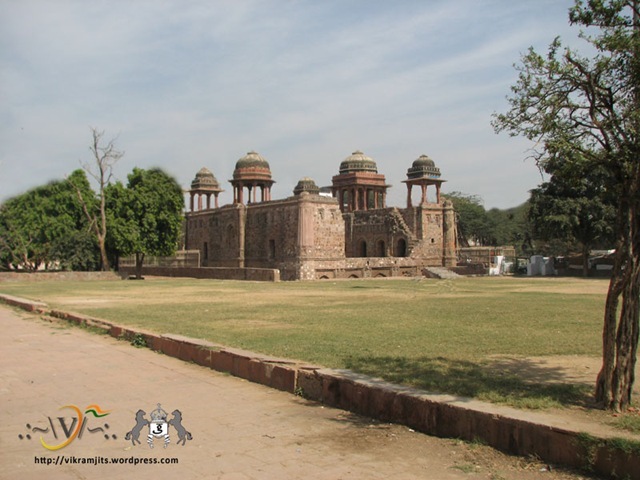 Built by last second king of India, Emperor Akbar Shah II (Badshah Abu Nasir Mu’in ud-din Muhammad Akbar Shah II a.k.a. 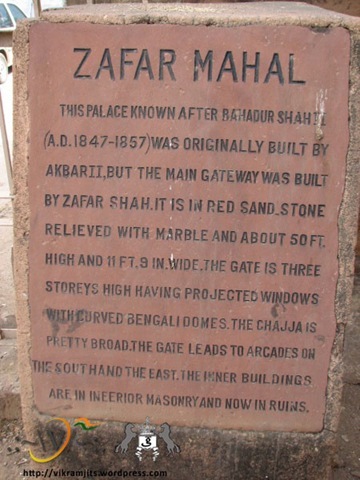 Mirza Akbar) in 18th Century, it was refurbished by his son, the last Mughal king of India Emperor Bahadur Shah Zafar II (Badshah Abu Zafar Sirajuddin Muhammad Bahadur Shah Zafar). 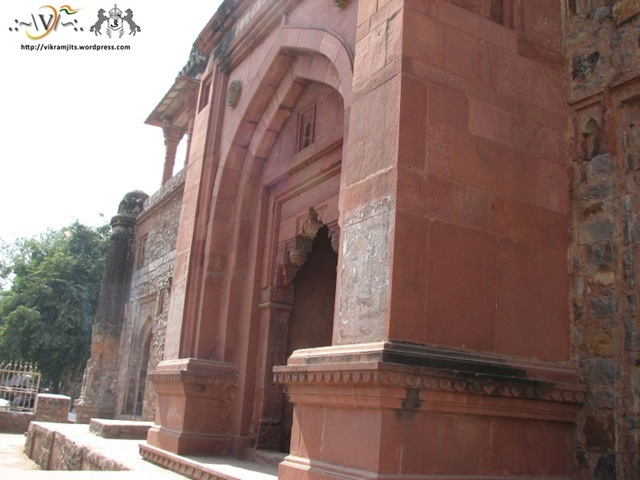 The image on left is of HATHI GATE, built by Bahadur Shah Zafar II in the eleventh year of his accession as Emperor in 1847-48 AD. 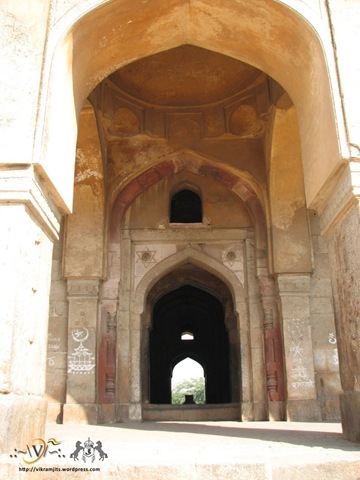 A broad Chhajja (cantilevered projection) built in the Mughal style is a striking feature of the arch. 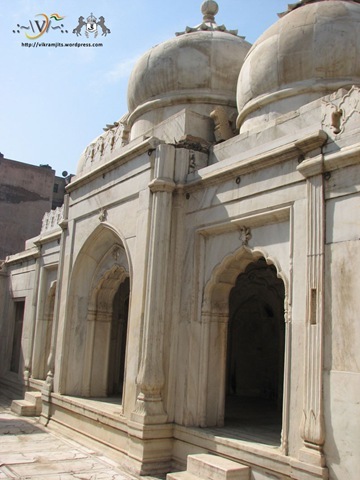 At the entrance gate, the logo has small projecting windows flanked by curved and covered Bengali domes. On both sides of the arch, two ornate medallions in the form of large lotuses have been provided. 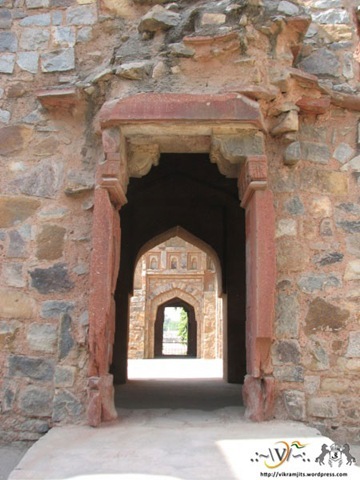 The gateway also depicts a classic tripolia or three-arch opening into the baaraadaree or 12 opening structure, which fully draws the breeze. 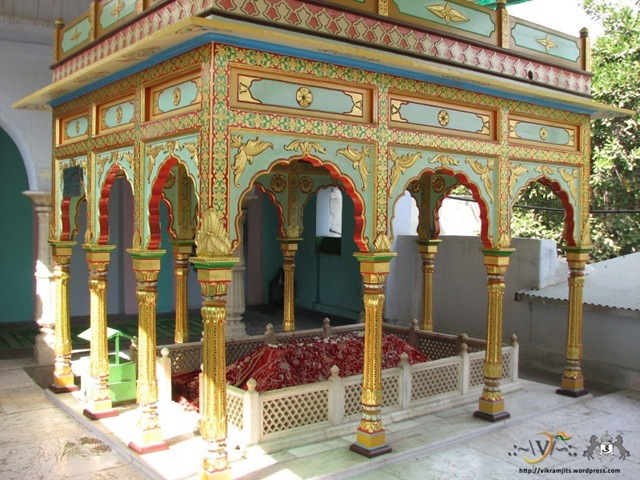 It is said that Bahadur Shah Zafar II wanted to be buried at this place, next to his father’s grave near his idol Hazrat Kaki’s tomb. 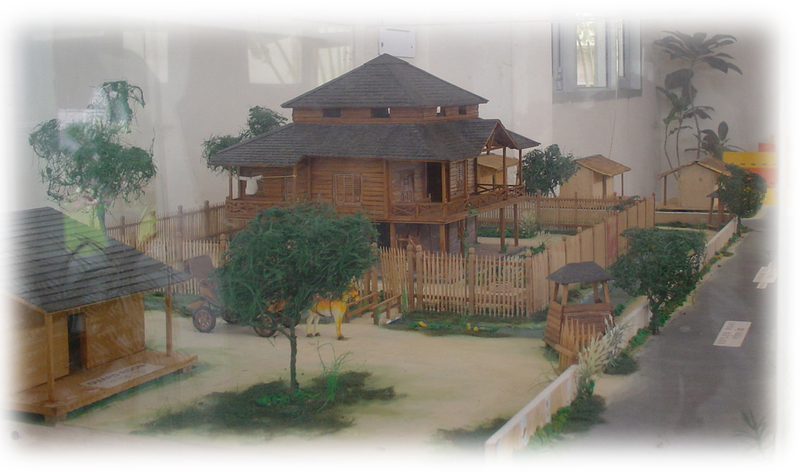 Model of the Bunglow in Rangoon (British Burma), where Bahadur Shah Zafar II was kept in his last days (during exile). 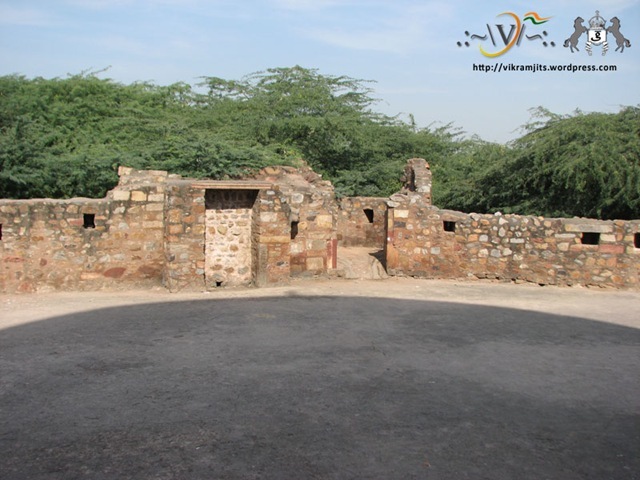 Later, Satguru Ram Singh, the famous rebel from Punjab, who pioneered Kuka Movement was kept in exile at this place. 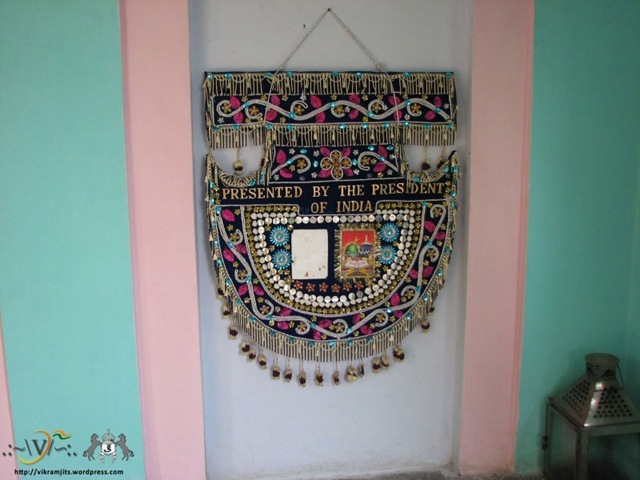 Currently this model is placed at Sri Bhaini Sahib Gurudwara in Ludhiana, Punjab (India). 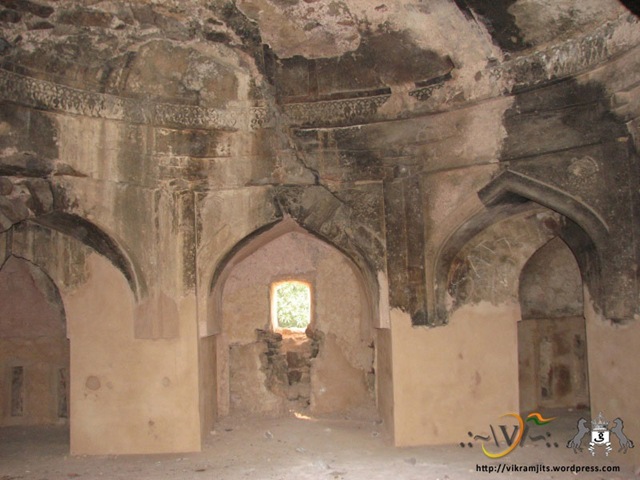 Zafar Mahal was under local encroachment till some time back, when Archeological Survey of India took it and starting restoring. Now, they are planning to start a Mughal Museum here. Articles will be brought in from Red Fort and other places. 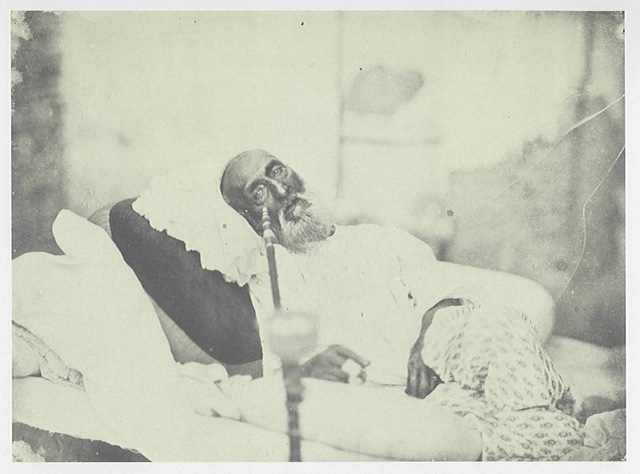 I recently learned that Indian Government is also holding talks with Yangoon’s government to bring back the remains of Bahadur Shah Zafar to India, and place them here. This place has been brutally misused by locals. But ASI is trying to help it out. The architecture is really nice and exhibits a touch of Indian-Mughal style. 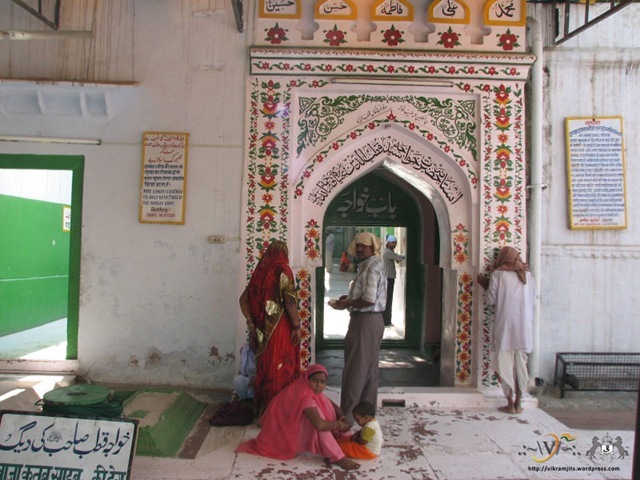 The Dargah shrine of Qutbuddin Bakhtiar Kaki has also been the venue of the annual Phoolwalon-ki-sair Festival (Festival of flower-sellers) in autumn, which has now become an important inter-faith festivals of Delhi . 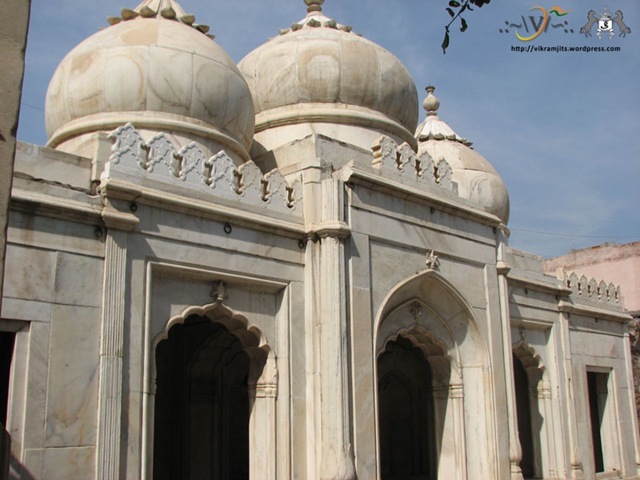 The festival has its origins in 1812, when Queen Mumtaz Mahal, wife of Mughal Emperor Akbar Shah II (r. 1806-1837) made a vow to offer a chadar and flower pankha at the Dargah and a pankha at the Yogmaya Mandir, also at Mehrauli, if her son Mirza Jehangir, who after inviting the wrath of Sir Archibald Seton, the then British Resident of the Red Fort, was exiled to Allahabad, returned safely. And as the legend goes he did, and so began the tradition henceforth . 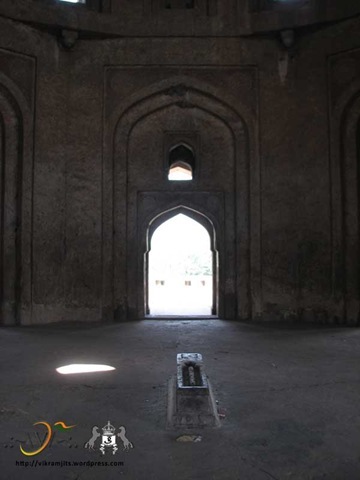 Incidentally, Akbar Shah II is now buried in nearby a marble enclosure, along with other Mughals, Bahadur Shah I (also known as Shah Alam I) and Shah Alam II . An empty grave also known as Sardgah of the last Mughal Emperor Bahadur Shah Zafar, can also be found here, as he had willed to be buried next the famous shrine, as did his previous Mughal predecessors, though unfortunately after his exile to Rangoon in Burma, he never returned and died there, talks of bringing back his remains here have been raised in the past, from time to time . 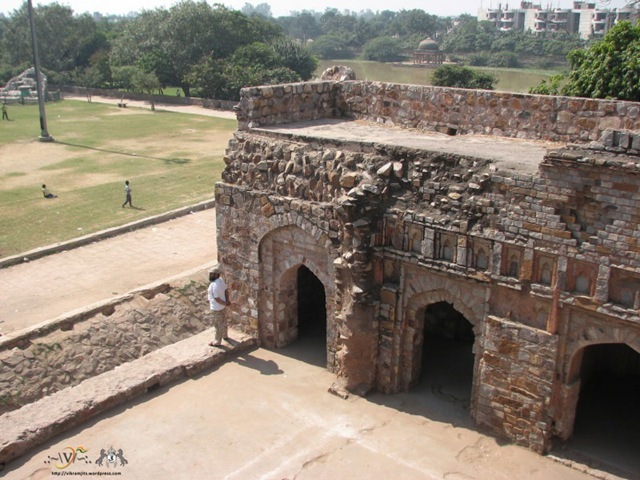 Delhi, in 14th Century was actually a set of 4 prime cities named Qila Rai Pithora, Tughlaqabad, Jahanpanah and Siri. 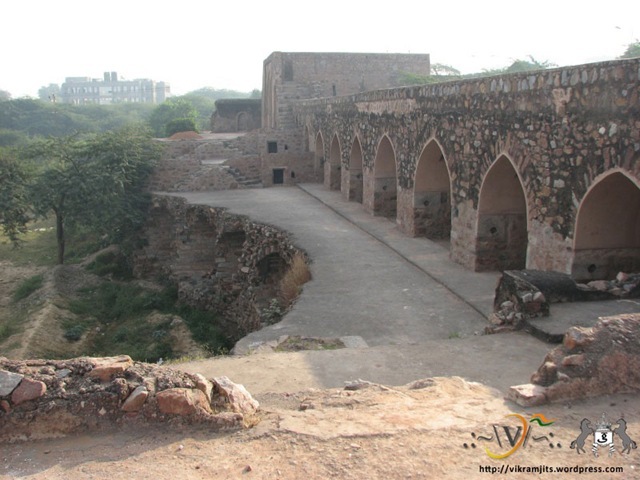 Built in 1323, Satpula, or the Bridge of Seven Openings (Pul) was a magnificent piece of Tughlaq architecture, which was connecting these principal cities. It was a remarkable ancient water harvesting dam. 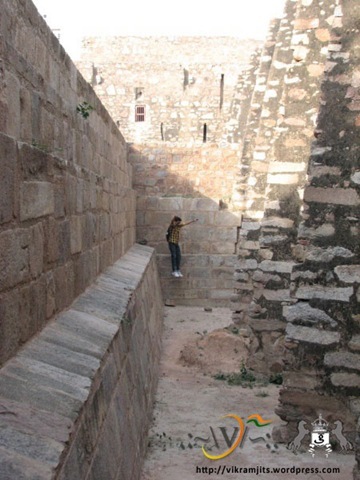 The objective of building the weir was for providing water for irrigation and also, as a part of the city wall, to provide defense security to the city against attacking armies. 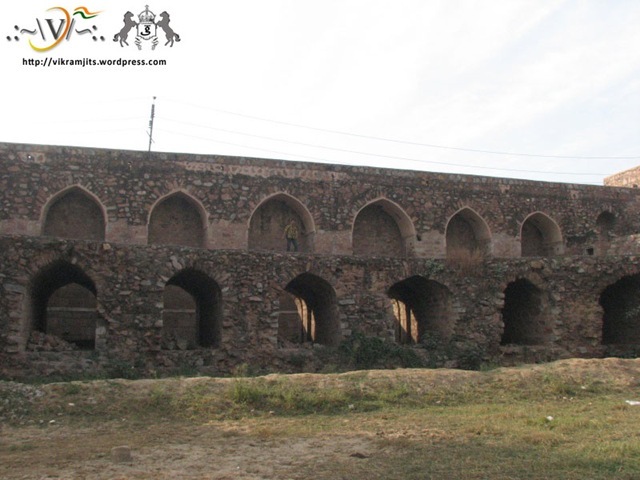 The weir, Satpula or seven bridges regulated impounded waters for irrigation. It has seven main openings with two additional subsidiary openings at each end. 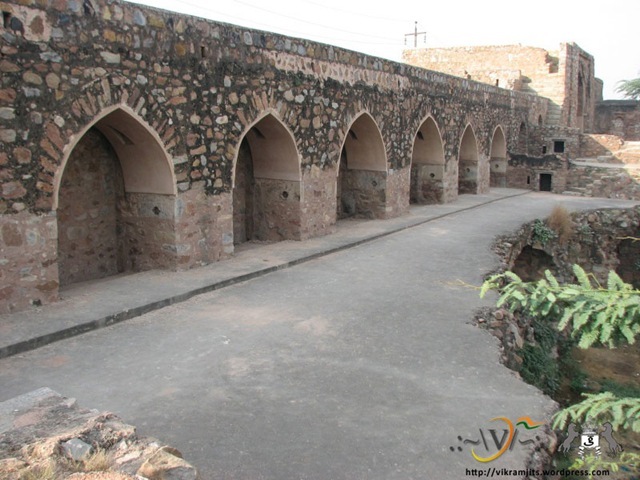 The sidewalls of each of the seven main arched openings have grooves for sliding gates or shutters, which controlled the flow of water from the artificial rain-filled lake to the south. Octagonal towers housing chambers with diameters of 19′-6" (5.97m) flank the weir. The chambers once housed a school, hence the monument’s alternate name ‘madrasa’. 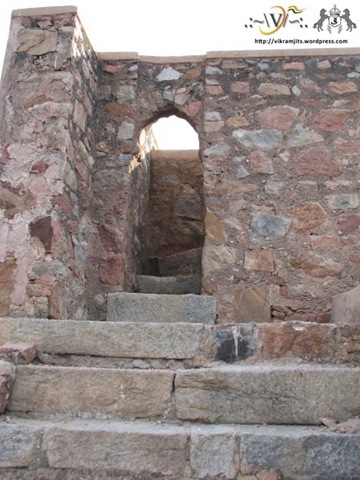 The location of the Satpula, which is a part of the east–west wall protecting the southern part of Jahanpanah, drains a catchment comprising a series of low hills on the south, east, and west. The stream draining the catchment area, known as Barapulla Nallah was planned to be tapped to store the run–off water of the catchment. 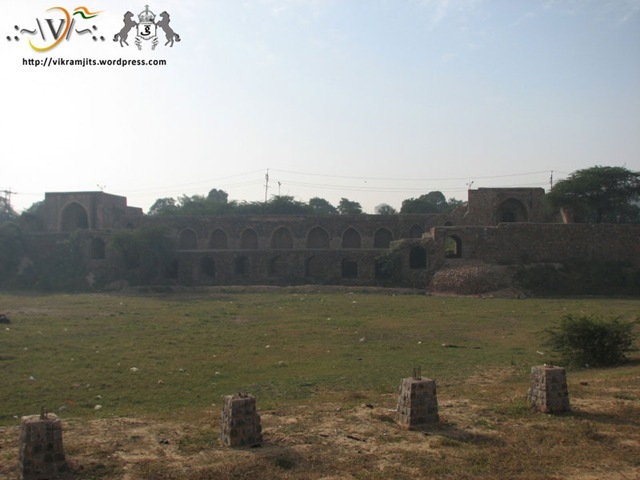 Command area for irrigation was identified in a large open plain on the northern side for providing water supplies from the proposed storage behind the Satpula, to grow irrigated crops to sustain a large population. 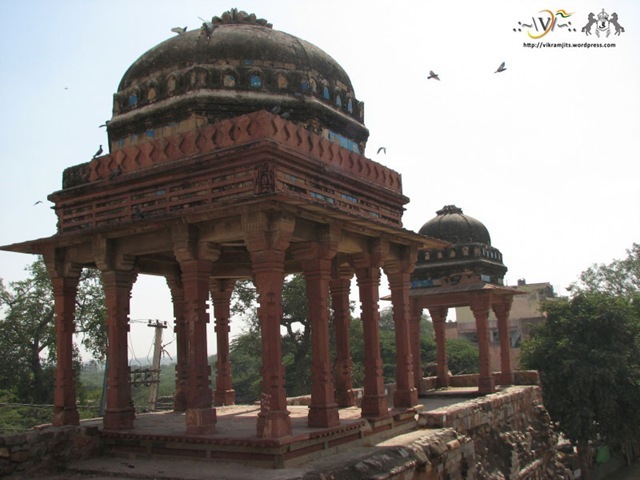 It is believed, locally, that the waters, which now are dried up had healing powers because saint Nasiru’d-Din Mahmud, also known as Chiragh-e-Delhi (Lamp of Delhi), performed ablution here. 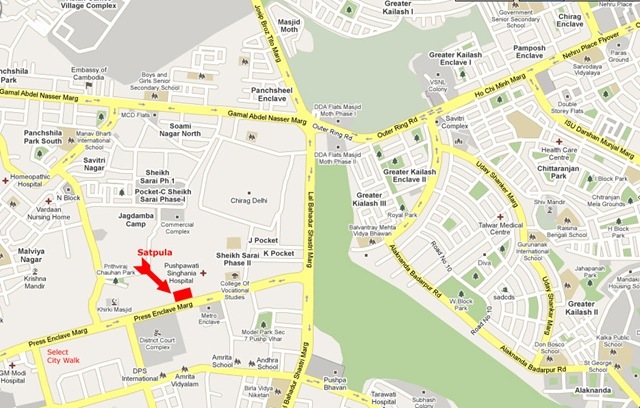 We started from Nehru Place, and went towards Lado Sarai. 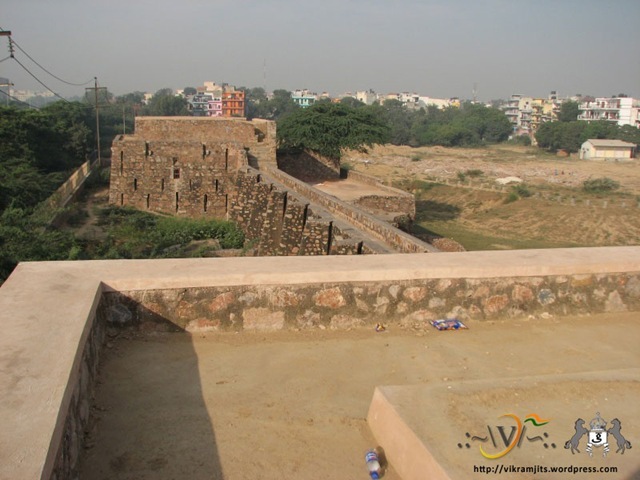 When we were about to reach MSG Metropolitan Mall and Select City Walk at Saket, we saw an old wall on the main road. There was no direct way to reach there. So we jumped our bike over the rough debris and drove over mud and rumbles for nearly 500 mts. We parked our bike and had a look behind the wall. Our eyes, left wide open, with a mesmerizing view of a long dam, with lots of small doors and openings. 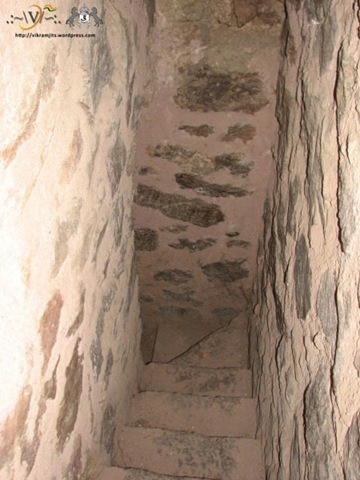 The image below (right side) is the entrance of stairs. I was wondering if I could fit in there, but it was fun. HAZRAT KHWAJA QUTBUDDIN BAKHTIYAR KAKI, r.a., born in 1173 was an Islamic Dervish (Sufi Mystic) following Chisti Order of Sufism. He was born in Aush in Transoxiana (A region in central Asia corresponding approximately with modern-day Uzbekistan, Tajikistan and southwest Kazakhstan) and left his body on 27-11-1235 in Mehrauli, Delhi (INDIA), where he is buried. 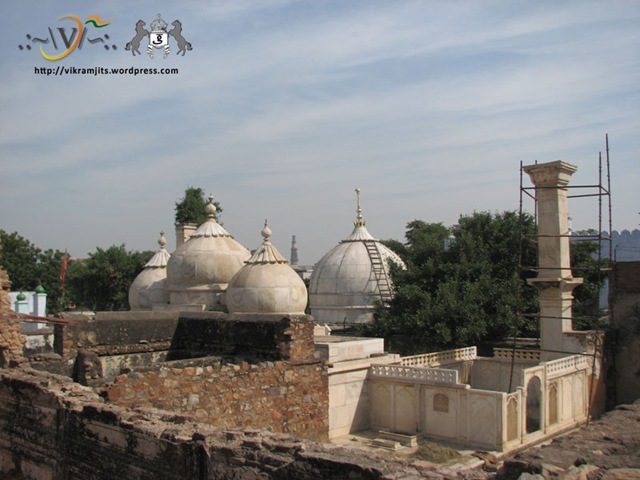 Hazrat Sahab was disciple and spiritual successor of Gharib Nawaz Hazrat Khwaja Muinuddin Chishti (r.a.), one of the most famous sufi saints of world. 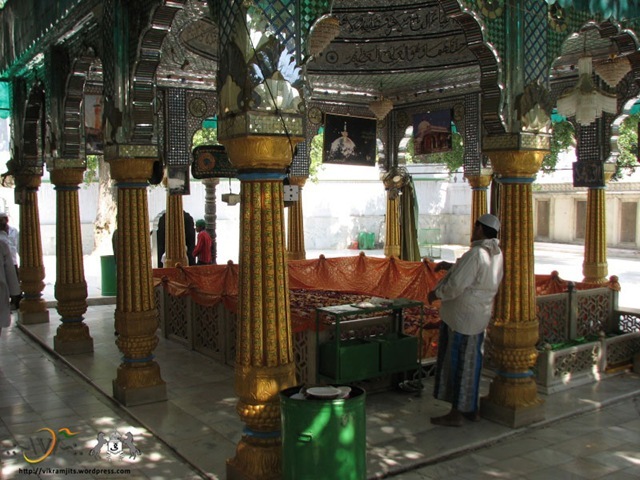 Further, his most famous disciple and spiritual successor was Baba Farid, who in turn became the spiritual master of Delhi’s noted Sufi saint, Nizamuddin Auliya, who himself was the Master of Amir Khusro and Nasiruddin Chirag-e-Delhi. His name was Bakhtiyar and titles were Qutub-Ul-Aqtab (Chief of the great saints) and the Qutub-ul-Islam (Chief of Islam). 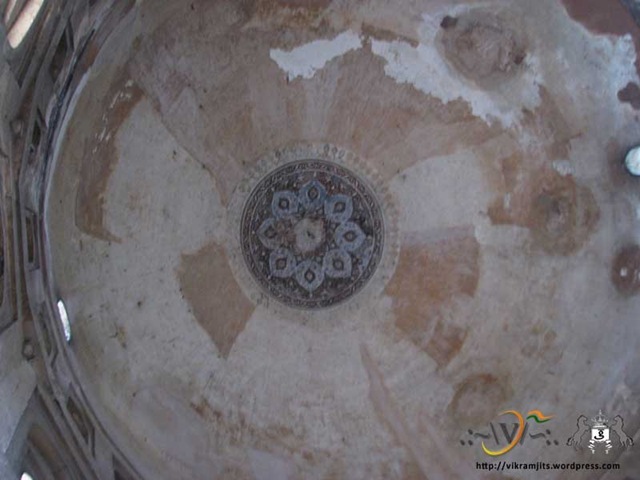 According to his biography mentioned in, Ain-i-Akbari , written by Akbar’s vizier, Abu’l-Fazl ibn Mubarak, he was the son of Kamalu’ddin Musa, whom he lost at a young age, and came from Ush, a small town in Farghana (present Fergana Province in eastern Uzbekistan, part of historic Transoxania). The name Kaki was attributed to him by virtue of a keramat(miracle) that emanated from him at a later stage of his life in Delhi . He also belonged to the direct lineage of the Prophet Muhammad, descending from Hussain ibn Ali. Khawaja Bakhtiyar Khaki was one and half years old when his father died . His mother arranged for his education. After we took these photos, some noble person from the shrine told us that photos should not be taken at this sacred place. So we stopped with further photography, and uploading only what we clicked. 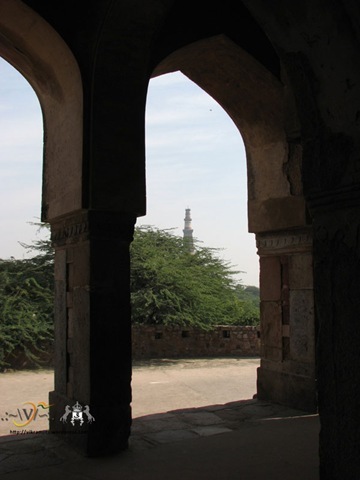 We went straight from Qutub Minar, and passed small congested streets of Mehrauli. 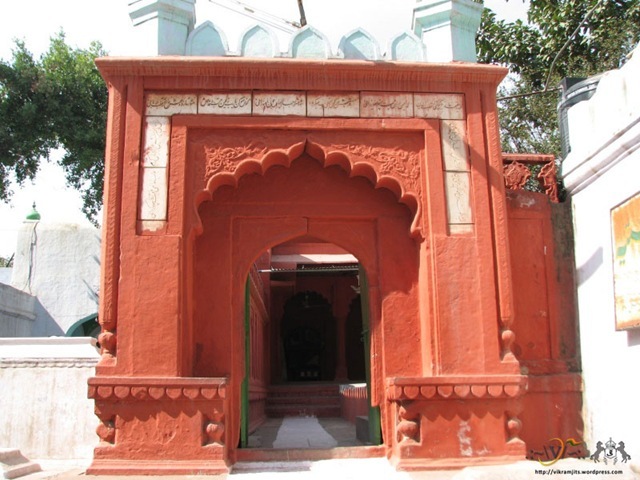 Though the main entrance of Dargah is on other side, we reached the back side of Dargah, which is also known as the Ajmeri Side or the Ajmeri Gate. 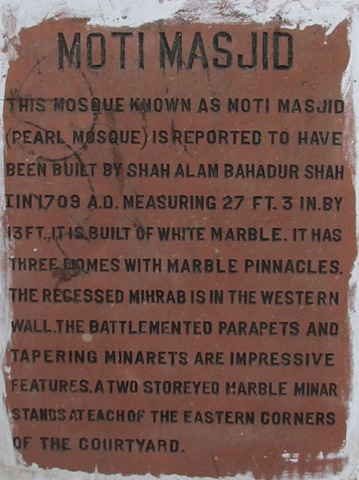 It is adjacent to Zafar Mahal, built by Akbar Shah II. 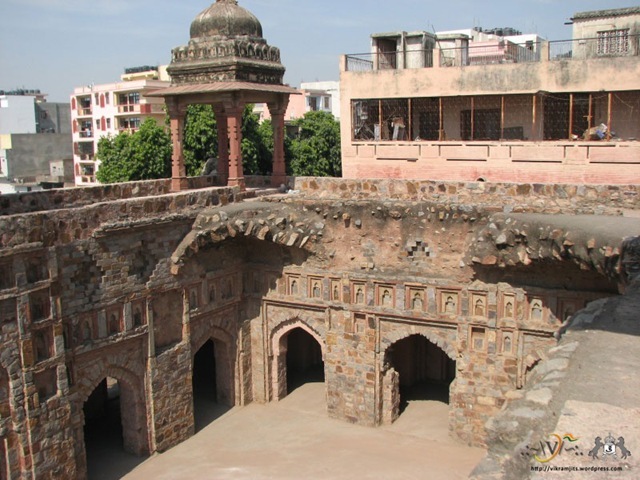 Also, next to the shrine is Moti Masjid, the private mosque of royal family residing in Zafar Mahal. 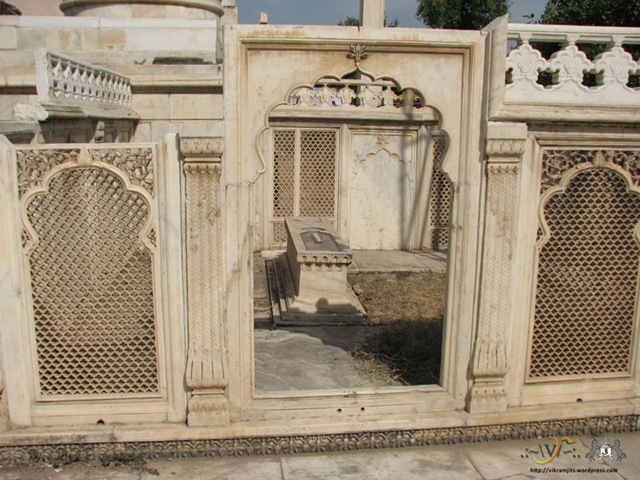 There are several other graves adjacent to Dargah, including that of Akbar II. 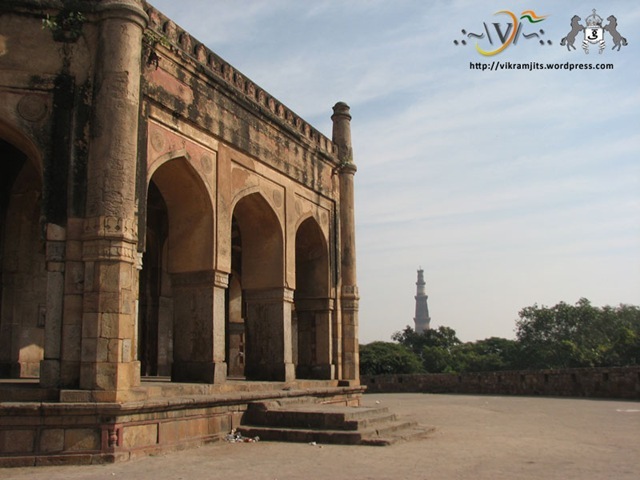 Moti Masjid (three Gumbads) and Hazrat Kaki’s Dargah (bigger gumbad) is visible from Zafar Mahal with Qutub Minar at Distance (between both). On right side, below that pillar (under renovation), lies the grave of Bahadur Shah I (in marble enclosure) and Bahadur Shah II (outside enclosure). 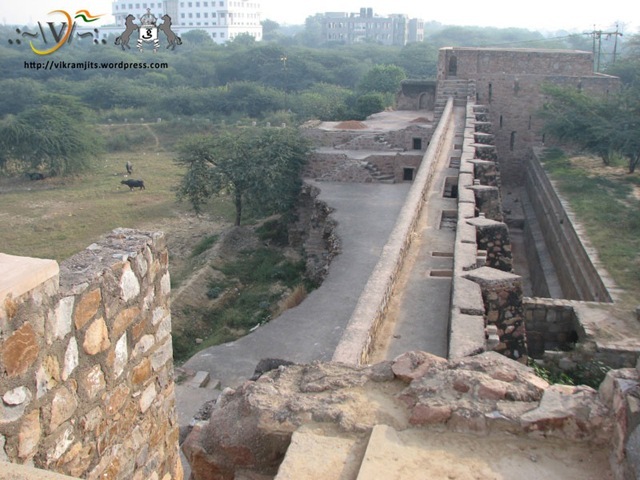 Ruins of walls of Zafar Mahal are also visible. 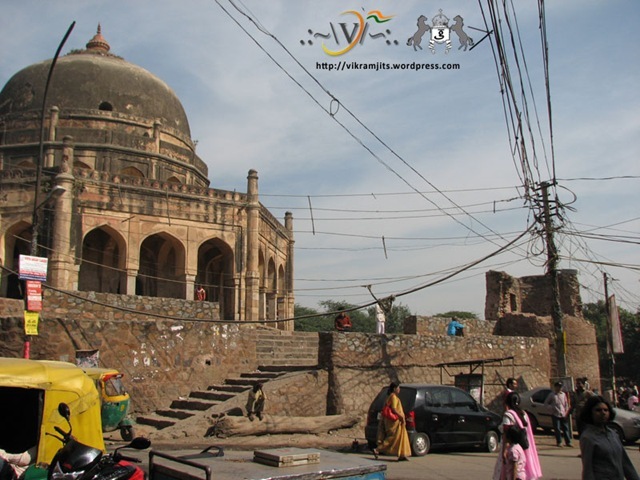 Go straight from Qutub Minar towards Mehrauli Market, crossing Mehrauli Bus Stand. 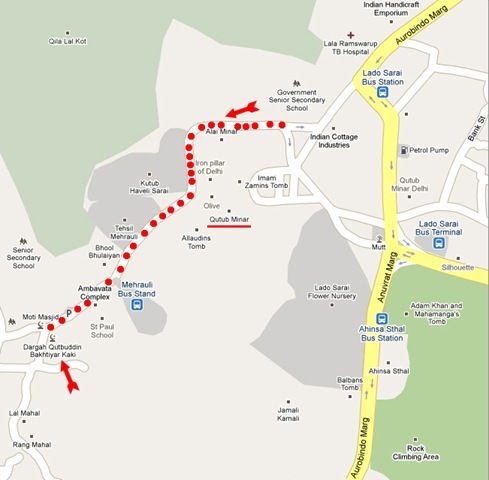 That straight road leads to Hazrat Kaki’s Dargah.